As you can see we have a new look here! This is my way of launching this new, beautiful, bespoke space. I may do another post, just on the nuts and bolts. But for now, here it is in all it’s new glory. My amazing, incredibly talented husband built this for me, all me. I am grateful beyond anything. I will pay him in thousands of dollars worth of cookies, cake, meat, and hugs. I am feeling full. Full of good food, inspirations, good people, and life in general. I am also, conversely, very ready for a vacation. I feel so full that it is time to take a break, reflect, perhaps drink, and eat more good food. A couple of weeks ago I went to The Big Travelling Potluck Food Bloggers Gathering, we don’t like calling it a conference. I met some incredible people, folks I will likely know for the rest of my life. Food blogging has a way of doing that to people. We understand this life we have chosen to live. We understand the trials, tribulations, hardships, and glorious ups we have on this path we travel. It’s no secret to those of us that choose this path there are ups and downs. We cook, photograph, write, edit, promote, and repeat because we love it. Hearing some of my favorite people speak over the weekend, connecting with old friends, and new ones, I feel rejuvenated in the sense of my blog life. As Ashley, from Not Without Salt said, “Date your Blog.” It is simple true advice. It is a work of art, a work in progress, just like any relationship. I am going to treat it as such, my love, which it really is, to me. Maggie Batista is a special woman. She writes, Eat Boutique, and is a kind and generous soul. We made homemade gifts with Food, Gift, Love in mind. Her genius business is putting food gifts from small artisans in gift baskets, they are sent all around the country. It was a great pleasure getting to know her, and what she is. A good person. It was rewarding gifting the homemade lavender sugar to my brother and sister in law when I ogt back to their house. Giving them ideas of what they could do with the sugar. Maggie, I get it, it feels good. Aran, from Cannelle et Vanille shared some things that spoke to my heart. We all have this life on the internet, it looks so perfect. But what you don’t know, because it can be very hard to share, is some of the day to day hardships we face in our lives. We all have them. Every singe one of us. I am no different, I have family I help, take care of in many ways. I don’t have the perfect relationship with people in our families, on either side. I struggle with things that have happened in the past. And in this life on the internet, I can’t share some of these a lot of the time because I am simply not ready to. Simple as that, maybe one day. As I look at my writing, I judge myself. Honestly not too often. I am the kind of writer that goes through phases. Sometimes I want to be poignant, sometimes I write like I talk. Irreverent, sarcastic, and flighty. I don’t hold myself to certain tones, because it depends on what mood I am feeling. I am not sure if that is fair or not, but I am working on that aspect. I want SEO and Goolge to find my posts, but I also am a genuine person. I make it natural, if it doesn’t work, my goal is to be genuine first, SEO second. This is, after all, my business. I am a teacher of recipes, I want you to find my recipes. So when Cheryl, of 5-Second Rule, asked us how we write, it made me reflect. And I was happy to find I balance the two sides pretty well. Cheryl is an incredible writer, a truly inspiring woman. She went against the grain at this blogger event in a way that I respect. She gave me some perspective on my writing, in a way that I listened. We did a writing exercise where she gave choices of first sentences, pick one and start writing. Mine brought tears to my eyes and a smile on my face, fairly immediately. “She moved in the kitchen.” I have not finished my story yet, but it is about my Mama. She loves food as much as I do, good food. Food that makes you go mmm. More on that another time. For now, I feel full. I am full. I am happy and grateful to have chosen this path, I was meant to be here for sure. I am elated that I met these women, some are friends now. I will cherish their words of inspiration, because that’s what I do. Thank you to The Big Traveling Potluck team, and the sponsors that make it all possible. Shout out to them is only respectful, in my opinion. Sabra, Gourmet Garden, Oxo, California Ripe Olive, Earthbound, Kerrygold, Fork in the Road, and KitchenAid. You rock and roll. We ate, shared, learned, reminisced from the past year, and at a lot more. To next year back in California, cheers! 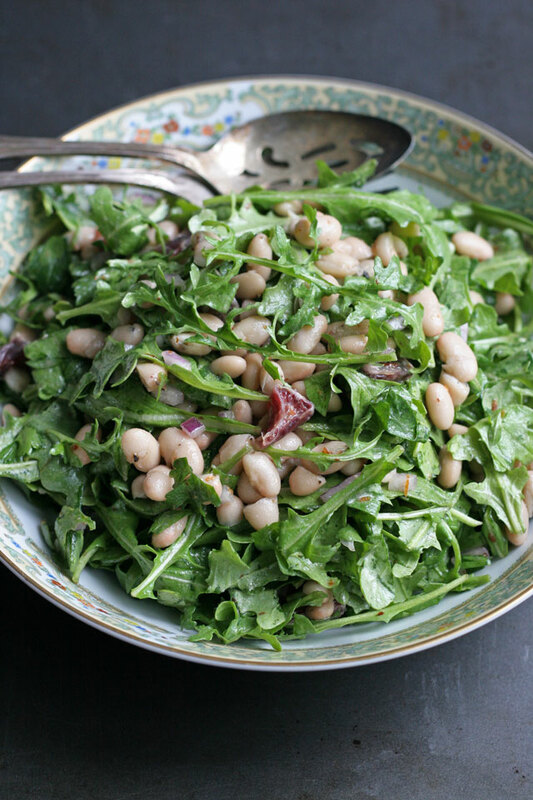 I made you this white bean and arugula salad with blood orange dressing because I wanted to, and the Potluck took place on farmland and I like salad. 1. Place the beans, and onions in a large bowl. Mix the dressing by placing the olive oil, juice, zest, salt, and pepper in a jar, shake well to combine. Or in a bowl, whisk to combine. Add the dressing to the beans, toss to combine. Add the orange segments, arugula and parsley to the beans, toss to combine. The site looks fantastic! Looks like all your thoughts and hard work are paying off! Thank you so much, Krayl. I appreciate it! Love the newblog design, and just reinforcing that you are awesome and seem meant for this- nurturing with both words and ideas for deliciousness! Congrats on your new site design! And this salad sounds amazing. 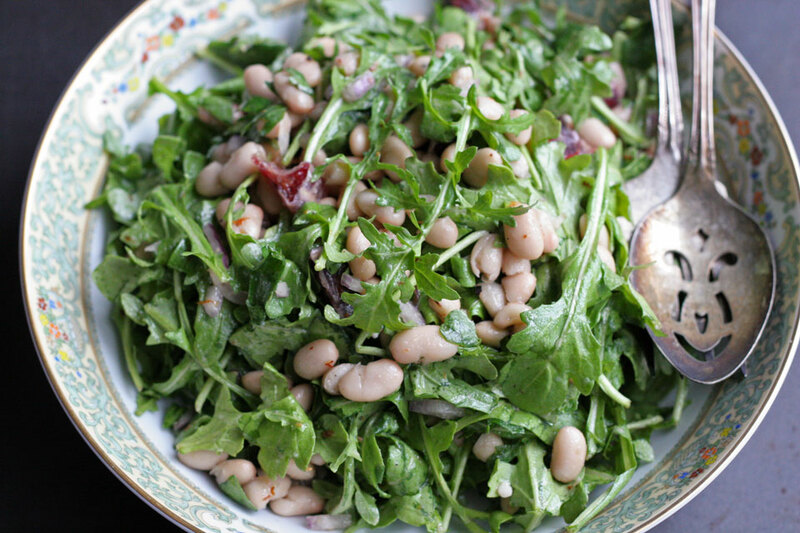 I love the combination of sharp, pungent arugula with hearty, creamy beans! Thank you so much! Arugula is my favorite. I was so lucky to sit next to you at dinner! I enjoyed our talk, and your company, and I look forward to seeing you again. I am lucky to have sat with you! And I am so happy we enjoyed that meal together, it was lovely talking with you. I hope we get to share a meal in the not too distant future. I hope you are well. Cheryl recently posted..See the unseen. I am very grateful for your guidance, thank you for being awesome. It was a pleasure to have time with you as well. I am certain the story will play out as it should, in its own time, and I promise I will not rush this one, or any other. Especially when it comes to telling my life stories. Thank you. The site is gorgeous! Kudos to your husband. I’m glad you had a good time at the Potluck. I was sorry to have missed it this year! Thank you so much! I could not be happier. I hope we can make it to another Potluck together another time.